Macbeth is a Scottish thane (lord) who is much admired for his bravery and skill in battle. One night on a stormy heath he meets a trio of witches who tell him that he will be king. With the aid of his powerful wife, Lady Macbeth, he plots and schemes with all consuming ambition to ensure the prophesy rings true. But once King, even Macbeth’s closest friends and allies soon become the targets of his treachery. As his guilt begins to overwhelm him, Macbeth once more seeks out the witches. They play on Macbeth’s weaknesses and ambition, creating a tyrant and throwing Scotland into chaos. This performance will run for approximately 2 hours and 20 minutes, including a 20 minute interval. This production is being judged for the 2017 Georgy Awards to be presented at the Eastbank Centre, Shepparton in November 2017. I have always been entranced by language, the written word and how it is used. I was first introduced to Shakespeare in high school and I loved how Shakespeare’s language brought a complex world of history, ideas, thoughts and emotion to life. When I saw a Bell Shakespeare performance of ‘Romeo and Juliet’ at the Melbourne Botanic Gardens, the magic of the words came to life and I was hooked. 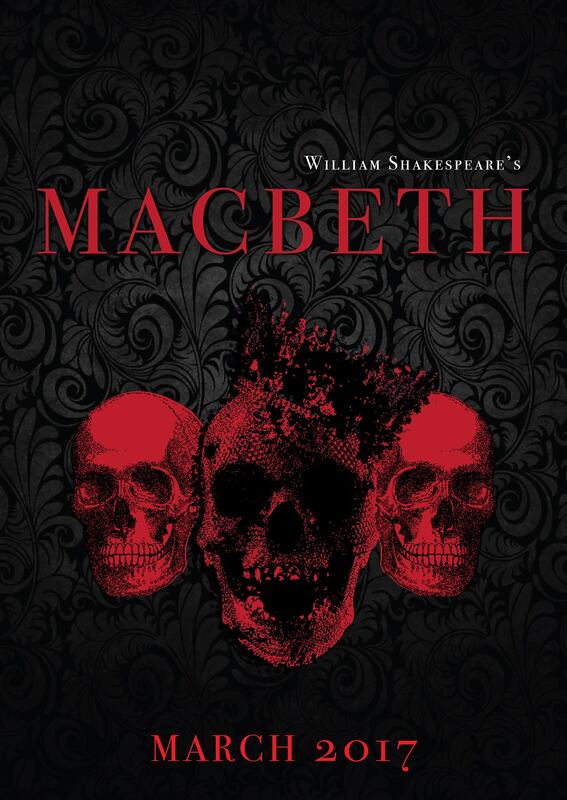 Macbeth has always been on my bucket list, as both an actor and director. The complex manifestations of Macbeth and his Lady’s minds, thoughts and actions are compelling to work with and the age old themes of revenge, guilt, betrayal and revelation of character play out in a beautifully written piece of work. For some time, Pieta Swann and I have been talking through ideas on how to bring Macbeth to a modern theatre audience. We hope you enjoy our reinterpretation. I have worked with a solid team of performers who come from all backgrounds and with varying levels of experience. They have all worked very hard and it has been fantastic to explore ideas together. Thank you for your dedication, your performances will reflect all the hours you’ve put in. I would like to thank my amazing production crew. Thank you Pieta Swann for reinterpreting the script, keeping me calm, keeping rehearsals running smoothly and for directing my work as Lady Macbeth. Thank you Ro McGillivray, for making some incredible costumes, managing the performance and for remaining positive and upbeat in the face of problems. Shoshanna Griffin, thank you for the time you have spent doing administration, and for your ability to get people to do things. Thank you Susan Vaccaro, for your work on our fight sequences and movement, and for understanding that actors are not dancers! Without the help and support of these wonderful people this show would still be a dream waiting to be ticked off my bucket list.